ORLANDO – Who wants to be part of a miracle? That’s what Dr. Bill Barnes, senior pastor at St. Luke’s UMC, Orlando, asked his congregation one autumn Sunday in 1996. Two hundred people responded, and the foundation was laid for Shepherd’s Hope free medical clinic. Nearly 17 years later, the miracle that church members signed up for has blossomed into a ministry that helps thousands of patients who otherwise would not get the medical treatment they need. Barnes had never studied the logistics of a free medical clinic and knew little of the healthcare needs in Orlando, but he was determined to follow God’s lead when he returned to St. Luke’s. “First thing Monday morning I say, ‘OK, God, if you really want me to do this, I need two people. I need a big picture person and I need a doctor,’” Barnes recalled. By mid-afternoon, God had delivered both. Two church members stopped by to ask how their husbands could be involved in mission. One was married to a Walt Disney World vice president, the other to a physician. Barnes knew God had helped him past his first obstacle, and divine help continued in the formative days of Shepherd’s Hope. Dr. Donald Diebel, right, discusses patient needs with volunteers at a Shepherd's Home clinic. Photo by Christie Hyde. The large, diverse St. Luke’s membership was a tremendous asset during those early years. Frequently the development team would identify a resource or opportunity at a local hospital, school district or company and then discover that a person of influence there was active in the church. So Barnes would add that person to the development team. That led to medical equipment, clinic locations, a hospital to partner with for lab work and more. Shepherd’s Hope opened on Valentine’s Day in 1997. The first patient was an unemployed licensed practical nurse seeking a medical exam needed for her employment search. The doctor who saw her insisted she get an additional test, even though the woman initially declined. The test revealed she unknowingly had cervical cancer. Shepherd’s Hope arranged for all of her surgical and post-operative care and chemotherapy treatments free of charge. Since then, the ministry has cultivated partnerships that allow volunteer professionals to see patients a few hours most weekday evenings in different locations throughout the Orlando area. Early on, Barnes sought to partner with other United Methodist churches in the area but could not find interest. One Saturday he preached at Florida Hospital Seventh Day Adventist Church. 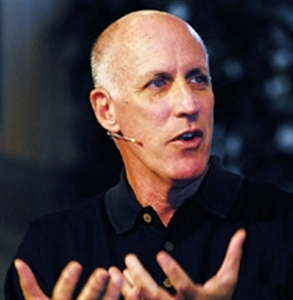 He asked church members to be part of a miracle, and they responded with support. More faith-based groups later joined the ministry, representing various Christian denominations as well as other faiths, including Judaism and Islam. Today, 23 different faith-based organizations support Shepherd’s Hope, including Sanlando UMC, Longwood, and First UMC, Winter Park. Grants and corporate partnerships also have proven critical in the growth of Shepherd’s Hope. In the early years, Shepherd’s Hope received several sizable national grants that allowed it to hire a full-time executive director. In recent years, grant funding has been harder to come by so corporate partnerships are crucial. “It’s advantageous for large corporations who have a lot of part-time people that aren’t covered by insurance to at least be able to tell their employees that they are supporting this ministry,” Barnes said. While funding is important for Shepherd Hope’s success, the most essential element has been volunteers. The ministry had 2,000 volunteers providing more than 20,000 patient visits and medical services in 2012. 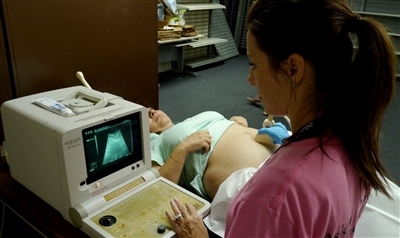 A volunteer technician performs ultrasound imaging on a pregnant patient at a Shepherd's Hope clinic. Photo by Christie Hyde. He and other volunteers say they enjoy giving their time and expertise because their efforts are appreciated. Dr. Deanna Tran, who practices family medicine in Pine Hills, said her parents always encouraged her to “give back to the community,” and she started volunteering at Shepherd’s Hope in 2006, during her residency. Testimonials from patients on the Shepherd’s Hope website tell different versions of the same story: job loss, no health insurance, serious illness and nowhere else to turn. Among them is Claudio, who had a tumor removed from his kidney after being examined at Shepherd’s Hope. Patients who receive Shepherd’s Hope services have income at or below 200 percent of the poverty level, are uninsured and not eligible for government-assisted healthcare programs. For information, visit www.shepherdshope.org. -- Christie Hyde is a freelance writer based in the Orlando area.